Hi all! Today’s my blogging day at InkSpot, the blog for the authors of Midnight Ink. I’m dedicating this month’s article to helping my fellow authors learn how to host a successful cover reveal contest. Check it out! We’ll be back to yoga next week! And what do you think of my newest cover for Karma’s a Killer? 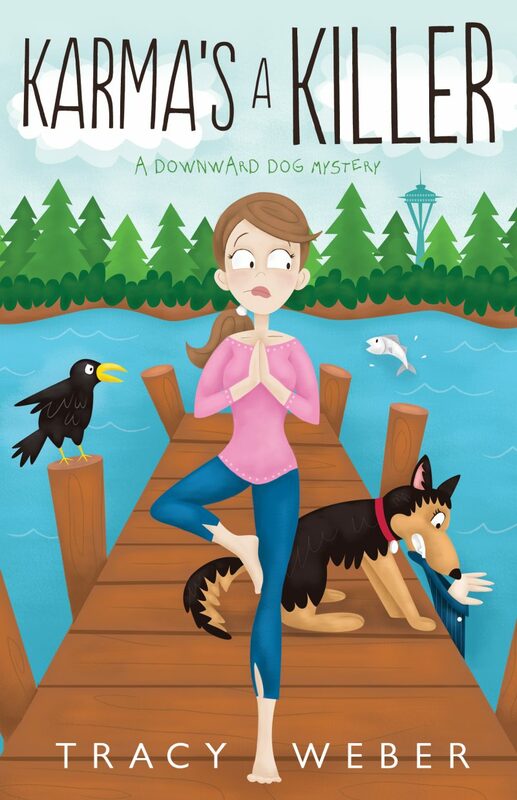 This entry was posted in Downward Dog Mysteries, writing and tagged cover reveal, downward dog mysteries, inkspot, karma's a killer, midnight ink on May 25, 2015 by Tracy Weber. This week’s blog entry was written by guest author Shelley Curtis. Shelley is a graduate of Whole Life Yoga’s 500-hour yoga teacher training program and a teacher at Whole Life Yoga. She can be contacted at sac68@earthlink.net. My confidence is easily shaken. This is something that has followed me from childhood, through young adulthood to where I am now. I’m closer to 50 than I care to admit and a mother of two young boys. I also teach yoga. Although I never thought I’d have children I have settled into the role with a passion I didn’t know I had. I recently read a quote that went something like this: “Making a decision to have a child – it’s momentous. It is to decide forever to have your heart go walking outside your body.” That’s exactly what it feels like. And even though I love my boys more than life and mother them with 110% of my heart and soul, I still feel like I make daily screw ups. Heck, some days it’s by the hour. Same with yoga. My passion for it has taken me by surprise. I was totally blindsided. I took Tracy’s 200 hour training when I was pregnant with my second son and at the outset didn’t really intend to teach. But the bug bit me and I fell hook, line and sinker. I started teaching prenatal women and then new moms and found it extremely rewarding as well as challenging – a great combination for my mushy mommy mind. Yoga had changed my life in a profound way. Then I took Tracy’s 500 hour training and my mind was really blown. My teaching changed and my own practice changed in ways that I would never have imagined. And the community of yogis that I became part of has kept me going and growing. They are amazing and inspiring. But just as with motherhood, I still feel like I make screw ups each and every time I teach. The most challenging thing for me lately is making sure I stay present and aware of each student. Teaching is like meditation for me most of the time. I am not thinking of my grocery list or how to make our bedtime routine less stressful or whether or not my son will eat all of his lunch. I am in the moment and totally focused on teaching. But even still, I feel like I miss so much. After each class I ruminate for hours. Did I keep that pregnant woman on her back too long? Did I not notice that someone was pregnant in my all-levels class? How did I forget to something for the upper back when that student said her upper back was tight? And it goes on and on. Sometimes I feel complete panic with the thought that I could’ve caused someone discomfort – or worse yet, injury. After every class I promise myself that next class I will be even more aware, even more present. And then I do it again. I lose a student in my memory. Someone I failed to be completely aware of, someone I failed to make a connection with. Tracy says I cannot possibly be completely present and aware of every student all the time. And I shake my head and say, “ Yes, oh wise teacher, you are right.” And then I worry some more. After almost 10 years of personal practice, more than 500 hours of training and 5 ½ years of teaching I still feel like I just stepped onto the mat. I yearn to teach with unshakable confidence and to let go of my doubts and anxieties. But I can’t help but entertain the thought that maybe, just maybe, this is what will make me a better teacher. The desire to make each class for each student special and unique. To meet each student where they are and bring them to where they want to be. Perhaps instead of trying to push away the doubt and anxiety I should allow myself to lean into it, to let it be what it is. And then maybe, I could be more at peace with my teaching. Perhaps that is the lesson I am meant to learn? 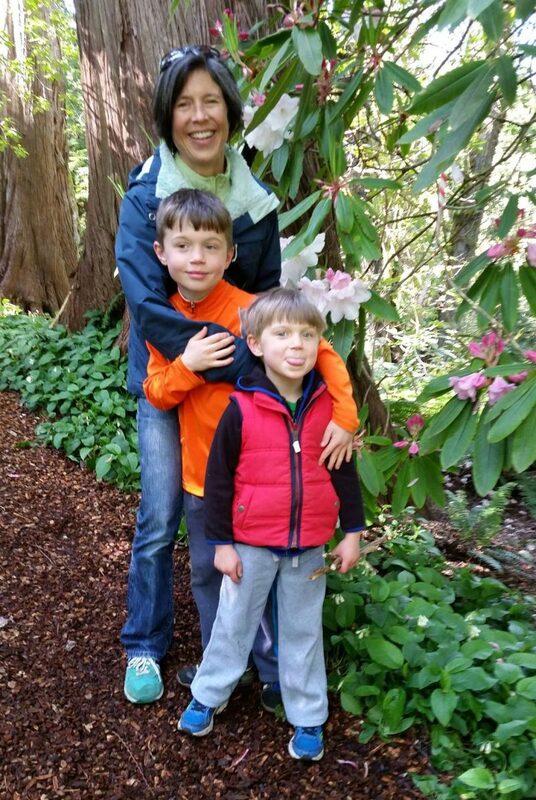 This entry was posted in Asana, Guest Writers, Teacher Training, Teacher Training Graduate Stories, Teaching Yoga and tagged compassion, yoga teacher, yoga teacher training on May 18, 2015 by Tracy Weber. It’s a Cover Reveal Contest! Each day Monday through Friday of this week, I’ll post an element of the cover on my Facebook author page https://www.facebook.com/TracyWeberAuthor. Before midnight that day, leave a comment naming the object pictured and you’ll be entered into that day’s contest. “Liking” my author page or “Friending” me on Facebook while you’re there is good Karma, but not required. Then, any time between when I post the final object on Friday, May 15 and Sunday, May 17 at midnight, send me an e-mail at Tracy@WholeLifeYoga.com with all five objects, and you’ll be entered for the grand prize “Agatha Sweepstakes” drawing for an autographed copy of all five of the Agatha Best First nominees AND an autographed advanced copy of Karma’s a Killer when it becomes available in August. Tuesday: An autographed copy of the second book in the series, A Killer Retreat. If you already own it, remember: books make great gifts! Wednesday: A Downward Dog Mysteries coffee mug. Thursday: An autographed book bag from this year’s Malice Domestic. Friday: An autographed advanced copy of Karma’s a Killer when it becomes available in August. Grand Prize: Autographed copies of each of the Agatha Best First nominees AND an advanced copy of Karma’s A Killer when it’s available. The object is…you guessed it…the Space Needle! Visit today’s post at https://www.facebook.com/TracyWeberAuthor and make your first entry! 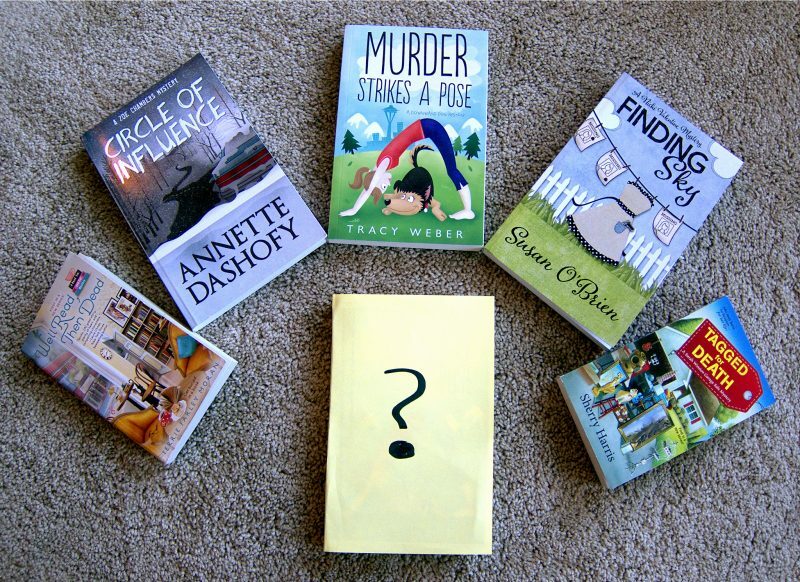 This entry was posted in Downward Dog Mysteries, writing and tagged agatha awards, contest, cover reveal, Cozy, cozy mysteries, cozy mystery, dog mystery, dogs, downward dog mysteries, downward dog mystery, gratitude, Karma can be Killer, karma's a killer, Murder Strikes a Pose, Tracy Weber, writing, yoga mystery on May 11, 2015 by Tracy Weber. As many of you know, I was nominated for the Agatha award for Best First Novel this year, and the convention and awards ceremony was held in Bethesda, Maryland this weekend. I didn’t win, but I had a blast! In case you were wondering what all the fuss was about, here are a few photos from the trip! The trip began with Tasha-dog begging me with her eyes not to go. But somehow I ventured forth anyway. This was the view from the balcony of near my room. Notice the question marks? We filled the entire hotel. Three of my fellow nominees greeted me when I arrived at the hotel. And I took my first ever selfie with my brand spanking new smart phone, which was purchased specifically for the event. I soon discovered that nothing beats jet lag better than a glass of free champagne–provided by the hotel! 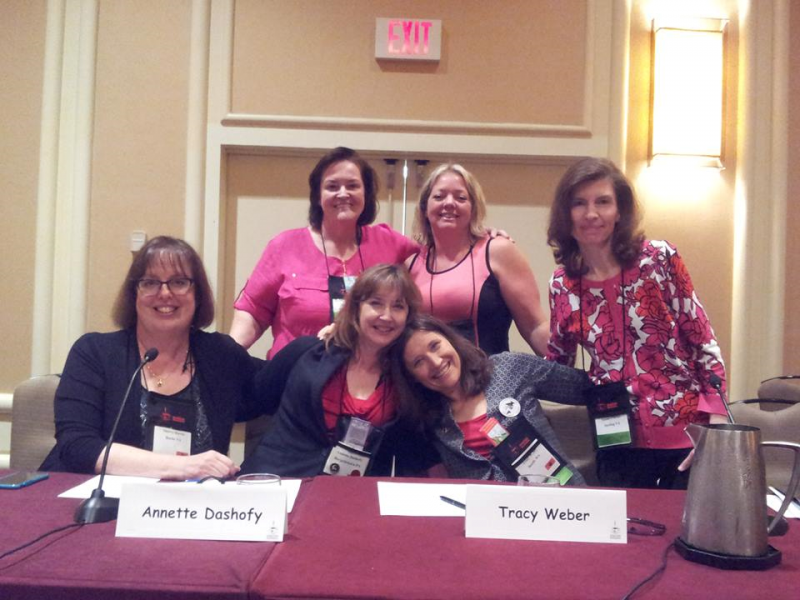 My fellow nominees and I looked a little more refreshed at our panel the next day. Then it was off to a celebration reception for the 10th anniversary of my publisher, Midnight Ink! Where some of my new friends signed up to sit at my table. We all ate dinner and a to-die-for dessert served in a chocolate tea cup! I was much too road-worn to take any selfies the next day, but suffice it to say that the woman at the airline check-in desk asked (in all seriousness) if I was well enough to fly. The whole experience was amazing, but the best part by far was meeting these other incredible ladies! Congratulations to all: Annette Dashofy, Terrie Moran, Susan Obrien, and Sherry Novinger Harris. Please, everyone, buy their books and support these fabulous, fabulous writers. This entry was posted in dogs, Downward Dog Mysteries, Gratitude, writing and tagged Agatha Nominee, downward dog mysteries, Malice Domestic, Murder Strikes a Pose on May 4, 2015 by Tracy Weber.